In 1813, at the Main Street, Lexington, residence of Dr. T.S. Bell, a young minister named James McChord preached a series of sermons. Preaching in a home in this way was against the by-laws of the Associate Reformed Presbyterian Church of which McChord was a member. Due to the conflict that these sermons caused, McChord decided to leave Lexington, a decision that was not to be implemented because of widespread support from those who had attended the services at the Bell residence. Many of these people were among Lexington’s most influential citizens, and together they decided that their church would function independently of the Associate Reformed Presbyterian Church until the conflict with the denomination could be resolved. These individuals included Robert Smith Todd, father of Mary Todd Lincoln, Joseph Campbell Breckinridge, father of Vice President John C. Breckinridge, General Thomas Bodley, General Leslie Combs, Farmer Dewees, Matthew Kennedy, John McChord, father of James McChord, George Norton, Governor John Pope, and James Morrison. 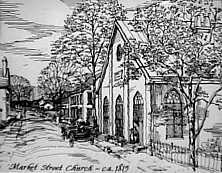 The congregation became known as the Market Street Church because its first building was located on Market Street. The building was dedicated on July 30, 1815, with James McChord as Pastor and fifteen communicant members. It remained an independent church until 1818, when McChord resigned from the Associate Reformed Presbytery, and both he and the congregation joined the West Lexington Presbytery. The church now became the Market Street Presbyterian Church. McChord remained with the church full time until 1819. During these years two important difficulties arose in the ministry. The first was economic. The end of the War of 1812 brought about a national economic recession. This created a domino effect for the Market Street Church. 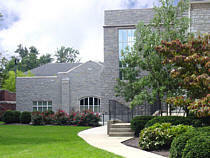 The recession impacted the Lexington business community, reducing the financial support of members for the small church, and forcing it into financial difficulties. As a result, McChord could no longer support his family on the small salary he was receiving as Pastor. The second problem McChord faced concerned the true commitment of the congregation to the cause of Christ. McChord’s preaching style was appealing to many, but when he began emphasizing redemption and commitment on an ongoing basis, some of the people became uncomfortable and withdrew their support. McChord continued to serve the church part-time until his death in 1820, at the age of 35. 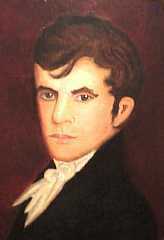 He had been elected in 1820 as the first President of Centre College in Danville, Ky., but died before he was installed. His funeral was held at the Market Street Church and he was interred in a crypt beneath the pulpit. McChord’s grave remained at the Market Street location until 1924, when he was interred in the Lexington Cemetery. Following McChord’s death, the Market Street Presbyterian Church continued to prosper. In 1823, the church organized a Sunday School, believed to be the first such school in Lexington. That same year, the church was renamed the McChord Presbyterian Church, in honor of the late founding pastor. In 1828, feeling that it was inappropriate to name a church after an individual, the church was given its current name of Second Presbyterian. Under the leadership of a succession of strong pastors, Second Church continued to grow. In 1846, when the Rev. Dr. John Howe Brown was installed as pastor, the church had 168 members. Dr. Brown was one of Kentucky’s great pulpit orators and the original building soon proved itself too small for the crowds, which averaged around 300, that attended. The building was razed and a larger structure was built on the same site. 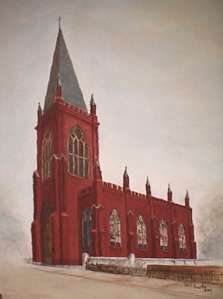 The new building was dedicated on October 31, 1847, and contained a sanctuary that had a seating capacity of around 700. Several weeks after the dedication, Mary Todd and Abraham Lincoln attended Thanksgiving services in the new sanctuary. The future president and his wife were in Lexington visiting her family. Rev. Brown remained at Second until 1853. In 1857, Dr. Brown became the pastor at the First Presbyterian Church in Springfield, Illinois, the same church where the Lincolns attended services. Following the Civil War, the Presbyterian Church divided along regional lines, North and South. 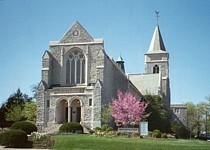 Second Presbyterian Church was the only local Presbyterian Church to affiliate with the Northern Presbyterian Church. The focus of Second Church following the division was that of local mission. During the remaining years of the 19th Century, the church membership grew to around 710 members which enabled Second Church to initiate various outreach projects. These included the formation of a Sunday School for African-American children, the building and operation of the Campbell Memorial Chapel in Irishtown, the Pastor’s Aid Society, and the organization of the Young People’s Society of Christian Endeavor. In 1917, two years following the centennial celebration of Second Presbyterian’s founding, the building was destroyed by fire, the result of sparks from a block fire igniting pigeon nests in the church tower. The building was a total loss. From 1917 to 1924, services were held in the Ben Ali Theatre on Main Street (in the area now referred to as the Ben Snyder block). Second Church maintained an average membership of 578 members during the seven years of services held in the theatre. In 1922, a lot on the corner of Main Street and Ransom Avenue was purchased for the site of the new building. The new church, designed by the architectural firm of Cram and Ferguson of Boston, Massachusetts, was dedicated by Pastor Dr. Benjamin Jay Bush, on December 14, 1924. The new building was built in the American Gothic style, with the sanctuary designed in the form of the Cross. In 1928, the Rev. Dr. Jesse Herrmann was installed as pastor and served for twenty-five years until his death. Beginning with the ministry of Dr. Herrmann, major growth occurred in the areas of mission and church membership. The church began sponsoring overseas missionaries, schools in Eastern Kentucky, helping form new churches in rural areas of Kentucky such as Cow Creek, as well as continuing its tradition of local mission. Second’s membership began to grow as well. When Dr. Herrmann began his pastorate at Second, the church population was 592 members. When his pastorate ended in 1953, the church had grown steadily to 845 members. Jesse Herrmann was followed by the Rev. Dr. James W. Angell, who led the church into the fight for civil rights. Many younger people joined the church in these years, with the Christian Education wing being built in the later 1950’s. Jim Angell’s ministry was followed by the pastorates of the Rev. Drs. Maurice Robertson, Edwin Stock, and Ronald P. Byars. The tradition of strong preaching and worship at Second were key features of Dr Byars’ ministry from 1980-1993. In these years the northern and southern streams of the Presbyterian Church reunited, and in 1983, Second Church became a part of the Presbyterian Church (USA). In 1994, the Rev. Dr. David Renwick was called as Pastor. During Dr. Renwick’s tenure at Second Church, ending in June of 2006, the church’s role in local and out of state mission increased. Second Presbyterian became involved in a non-denominational community organization called “Building a United Interfaith Lexington through Direct Action”, better know as B.U.I.L.D. Its purpose is to bring about positive change within the Lexington community. Pastor Renwick was one of Lexington’s clergy who was instrumental in the creation of this organization. During the past fifty years, the church’s membership has remained strong, averaging about 1,000 active members. The church, however, has seen many changes in that time. The present building, built as a “surburban” church at the edge of town in the 1920’s, became a “downtown” church. Growth in the congregation lead to expansion of church facilities with the Christian Education wing in 1954, and a new Fellowship Hall in June, 2003, along with other renovations to provide easier access for all. 3) creating multiple entry points into the life of the church and multiple choices for involvement. Second Church has a rich heritage — and a bright future. We hope that you will be a part of that future as we began our third century.